Click here for a summary of the first round of island exploration. This is the third and penultimate round of island exploration. The final round will follow the tournament this weekend. After this weekend’s Featured Matches, factions receive the following exploration options. Bilgewater may claim any island not yet claimed by another faction. The Shadow Isles may select either Neritum or Kibu. The Freljord may choose to revisit Argyre, or select a region of the mainland to explore. Ionia may select a region of the mainland to explore. Three islands will be assigned by the tournament this coming weekend: first and second place will get to choose an island each, and third and fourth place will share the last island between themselves. These islands are unlocked and unclaimed. Bilgewater and SI may select an island from this list. There is virtually no mention of Neritum in the ancient texts that have been deciphered so far. Indeed, the only clear reference to Neritum is in a book of epic poetry, in which one of the characters is said to be a Neritian swordsman. There are signs of an active civilization now existing there. It does not appear particularly welcoming. Scouts report seeing enormous statues of a king of some kind, who does not seem very nice. Back on Valoran, Syndra has been seen laughing maniacally while reading the League’s reports about Neritum, which are paraphrased above. She is said to be eagerly watching to see which faction will claim the island, so that she can discuss it with them. BWAHAHAHAHAHA! These islands are cordoned off. However, given its rather striking 3–0 victory over Ionia, Bilgewater could pull some strings and gain access to one of these. Is that a dinosaur? Yes. Yes, it is. Mag Mell has always been known as a savage land, with extreme levels of volcanic activity and bizarre wildlife. There are stories of heroes voyaging to Mag Mell to do battle with fire elementals and the like. They may only be stories, but they have the ring of truth—not least because, unlike most such legends, in these stories the heroes often don’t come back. The following regions are available for exploration by the Shadow Isles. They could also choose to revisit Daeyux, though they likely need more time to gather their strength after their ill-fated first attempt. For each, I’ve indicated the general type of event that would be available. Monsku is a northern region of Nyroth, covered in evergreen forests. It is cold and inhospitable, but not frozen over like the Freljord—though snow has begun to fall. Many temples, libraries, and other centers of learning are located here, now mostly in ruins. Nyrothian lore mentions it often as a place of scholarship and research, to rival the finest academies of Yoroth. The factions of Valoran have settled in Monsku, building makeshift camps around the Port of Stormhaven established by Bilgewater. The League has successfully created a small embassy with a ritual summoning circle. This conduit allows Summoners and Champions to teleport between Valoran and Nyroth. (As with the teleportation circles that link the Institute to the various regions of Valoran, only Summoners and Champions possess the innate magical power to travel in this way, and they cannot bring significant quantities of materials with them. A Zaunite warpgate could, perhaps, be used to allow larger-scale transport. 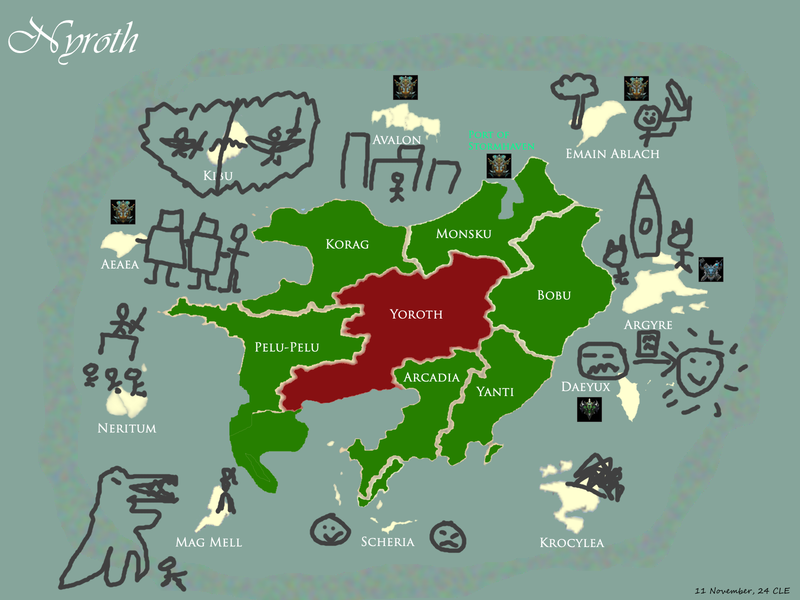 Bobu is located along the eastern coast of Nyroth, and enjoys more a more temperate climate. It was once a wealthy commercial center, and there are many ruined shipyards and factories. Pelu-Pelu enjoys a tropical climate. Although not apparently very fertile, and thus historically having a rather low population density and only minor economic-industrial significance, it sounds like it was a pretty nice place to live. Korag was once a major military and industrial center. There is a remarkable dearth of greenery here, even centuries after the cataclysm. The terrain is rocky and the climate quite cold; it is already blanketed in heavy snow. Summoners, you may cast your votes here. Polls will close in the evening of November 17. I’ve added in some questions about allies and rivals, related to the current forum discussion.